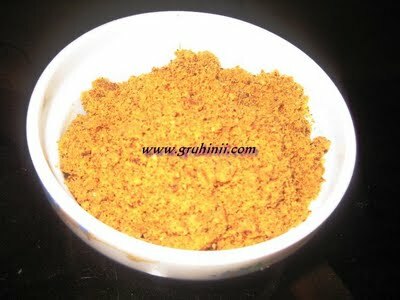 Fry Ground nuts dry (without oil) in a medium flame. Remove the skin and keep aside. Heat a tea spoon of oil in a pan. 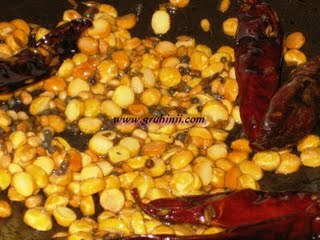 Fry rai, jeera, urad dal, chana dal and red chillies until the dals turn to golden color. Switch off the flame and let the ingredients cool. 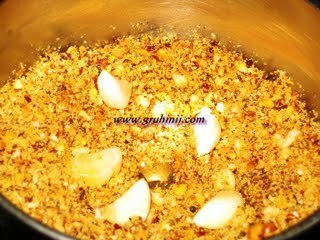 Grind all the ingredients along with the groundnuts in a mixie coarsely. Now add, salt, sugar, tamarind and garlic pods. Grind once again to roughly. Tip : You can store this for 2 to 3 weeks in a air tight container. Add little water to make instant peanut chutney.